When you come here you will find a cave: the hermit’s cave. This however is not just any hermit’s cave. It is "your" hermit’s cave! When you are here, in this place, you are the hermit and this is your cave. 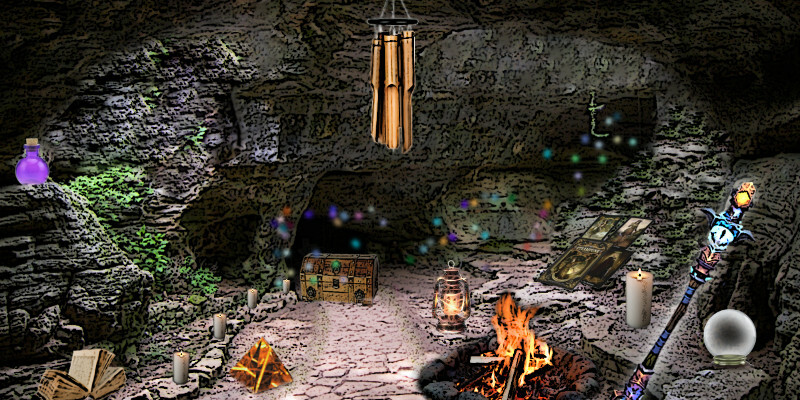 Inside your hermit’s cave you will find all sorts of magical goodies, all the tools you have collected along the way in your spiritual quest. You may think that a hermit’s cave would be dark and shadowy. But this is a spiritual place. The hermit is a symbol of what happens when you shut out outside distractions and let in spirit’s embrace and teaching. Spirit’s voice is low and subtle. It will not stand up to the harsh physical environment. So in order to learn and grow spiritually, a part of yourself becomes the hermit and, when you are in your magical cave, your focus is shielded from the outside influences. You can hear spirit and spirit can teach you. 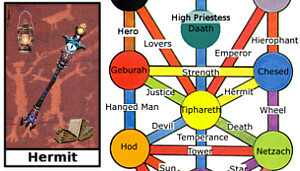 The Hermit’s Cave is located between Tiphareth and Chesed on the Tree of Life. With the energy of Tiphareth on one side and the energy of Chesed on the other, the Hermit’s Cave becomes a place of concentrated spiritual knowledge, full of secrets and magic. It is a place where knowledge over time creates wisdom. Knowledge without reflection or time to let it become seasoned can be hazardous and critical. Only the hermit can safely wield the most powerful magic or powerful reality creating safely. Every spiritual seeker must at some point become a hermit and let his or her skills mature. This place completes the "spiritual triangle" you started in the previous two places: the Meadow (temperance) and Hangman’s Peak (hanged man). In the Meadow you gathered strength from your ordeal in the diabolical three (tower, devil, death). New things were now possible. In Hangman’s Peak you get to meet spirit as an external force working with you to create your world. Here, in the Hermit’s Cave, you get to meet spirit as an internal force, loving and nurturing you, giving you strength, driving you forward to the new path that awaits for you. This is one of the few places where there can be an absence of spirit guides. (It is possible to meet a guide outside your cave.) The Hermit’s Cave is a place where you and spirit meet in the only way possible, in the intimate connection that resides within you. The cave amplifies your connection to spirit and strengthens your own ability to resist the glamor of realities that are not in balance. It gives you solitude and a place to rest and swim in the energy that is uniquely you and spirit’s. Your one time gift here is patience. Patience is a precious gift from the universe. It is the patient that can nurture and grow nothing into something. The universe took billions of years to become what it is now. Quartz crystals take thousands of years to grow. If that is not a lesson in patience nothing is. 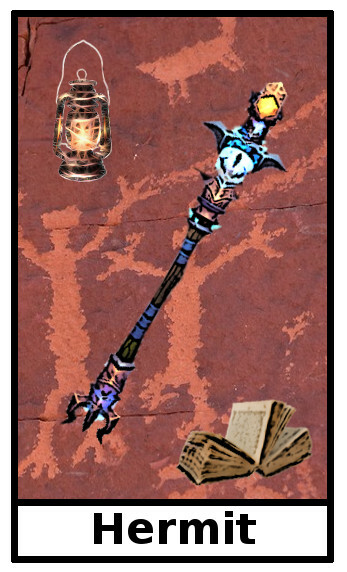 The quest here involves looking at and interacting with all the items in your cave. Unlike the cave in Infinity Valley ,which contains pieces of your past, this cave contains pieces of the spiritual parts of you that make you who you are. You will find no mundane things in this cave. Interacting with these magical items will help you see how the seemingly unrelated spiritual things you experienced and learned came to create the special spiritual being you are now. More importantly, the items here in this cave also represent the skills you will need to continue to walk your spiritual path. Visit here anytime you need to get in touch with your spiritual self or relearn some spiritual skill you have not used in a long time. Eraser: To remove destracting influences in your life. See also Kether City Inner City Apartment!